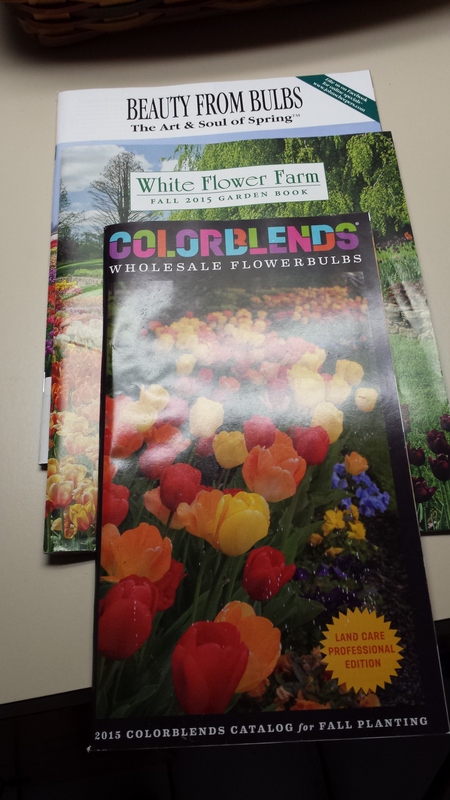 Here are a nice selection of catalogs from my local Connecticut bulb sellers. It’s time to plant some bulbs! Every part of the country–even warmer regions can do this. They just need to order something called “pre-chilled” bulbs. And please don’t tell me that you can’t plant bulbs because you have “fill in the blanks” critters. My yard is a Certified Backyard Habitat! I welcome all sorts of critters! Not only that, I am on a deer trail. They actually wear a path down to the bedrock in certain places in my yard parading (or marauding) through. Mama does park their babies in our woodlands. I’ve posted photos on here of that and of deer in the snow and of our herd of 6 (the regulars). I also have rabbits, squirrels, chipmunks and voles. That pretty much sums up the roster of bulb eating critters that you can have here in Connecticut. What do I do? Well, my worst enemy is my heavy clay so I have given up on having anything lovely like tall, regal tulips (deer notwithstanding. The heavy clay is too wet for that and it stunts the tulips and carries the same disease that caused the downfall of tulips in Tulip-o-mania. And while I’m okay with daffodils, they don’t naturalize for me–the clay is too wet and I can’t get them down deep enough in my soil–the bedrock is too close to the surface for that. So no huge swaths of yellow for me here. Therefore I plant something called the minor bulbs. Most are incredibly reliable, lovely and “critter proof.” And lots are early to come up in the spring too, which is exactly what you want after a long winter! More about these on Friday!